Life in the hospital with a busy one year old (OMG how is she almost one?!?) is exhausting. I had very unrealistic ideas of Kate going down at her normal 7pm while I had time to blog about each day, document our journey, tweet, facebook, edit pictures, and just having some quiet me time. Kate refused to sleep in the hospital crib and would only sleep in the small, uncomfortable, pullout bed with me. While I was holding her. Needless to say, I didn't do anything but hold Kate, play with Kate, feed Kate, rock Kate, entertain Kate, and pray that Kate would take a nap during our stay. That's right, all of that is past tense. Kate was discharged from Texas Children's today. She has been fever free since early Wednesday morning. After almost 72 hours of IV antibiotics, we were released. The new plan is to be readmitted on August 23 and start chemo on August 24 with a transplant date of September 2. I took the news of this delay very hard at first. It's funny how I was so stressed out when we heard Kate's transplant would be in August. It was so fast. How would I get ready in time? Yet now that we are delayed over 2 weeks, I am upset that we have to wait. We found out today that Kate tested positive for a cold virus and that is a big driver in our delay. Her transplant doctor wants her to be 14 days past the onset of fever before moving on to chemo. I know this is best for Kate and I am working on enjoying this time we have at home and trying to not dwell on the fact that we are delayed. Our donor is proving, yet again, to be an amazing young man. According to our coordinator, he said he would do whatever it took to accommodate whatever the doctors decided would be the best time for Kate's new transplant date. He continues to be the definition of selfless and put Kate's health and well being above his own. This man has also agreed to donate actual marrow (verses the easier method of collecting peripheral cells) because Kate's doctor requested marrow as it is the best option for Kate. We are so bless to have him in our lives. Even though I have no clue who he is, I know that he is a class act and I pray that we can meet him one day! Kate will be in complete isolation until she is readmitted. She will only leave the house to go to her appointments at TCH (and will be totally covered in her stroller for these visits). No one but Kate's nanny will be allowed in our house. Alex will take extreme precautions when coming home from work (changing, showering, excessive hand washing, etc). This may sound extreme but we simply cannot chance any illness causing even more delays. Kate's platelets are depleting quickly despite a transfusion on Tuesday and her ANC is the lowest it's ever been which means she is extremely susceptible to infection. While I am upset that we are now "behind", the test run at the hospital allowed Alex and I to realize some things that would be helpful (like a Swiffer vac b/c Kate makes a HUGE mess when eating in a highchair), things we need more of (pajamas/ outfits - she averaged 2-3 outfits a day), and things we don't need (my beloved smocked outfits just aren't necessary and take up room). We appreciated all of the thoughts, prayers, and support. I know I say it all the time but, we are so overwhelmed by the amazing support everyone is showing our family! It really means the world! And, I took some great pictures of Kate while she was in the hospital. Hopefully I will be able to edit them and post a few this weekend! Lindsey, I will be praying for your sweet Kate these next few weeks and all along your journey. I hope you will let us know if there are things we can send you or her to make your stay in the hospital and chemo treatments easier! I've been thinking & praying for y'all all week. Please let us know if there is anything that will help make the next few months pass easier. Always praying for you guys. I know it is frustrating but what an amazing thing to get a test run to see how to do things better. How awesome to be blessed with such an awesome donor. Praying especially for fever and germ free weeks for Kate, rest for you and blessings for the donor. Hang in there. Love you guys. The Buck Family. So glad you gave us an update! Kate's donor sounds amazing! We will continue to pray! I pray that Kate stays well these next two weeks and there are no more delays in her receiving treatment. I cannot imagine how frustrating that whole set back must have been, praying that will be the last one. Stay strong, you are doing an amazing job! 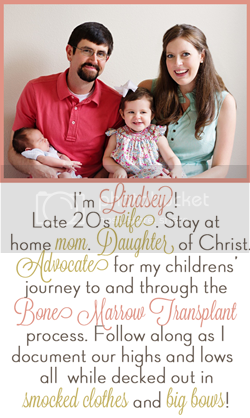 Lindsey, thanks for the sweet comments about my blog design. "As he went along, he saw a man blind from birth. His disciples asked him, "Rabbi, who sinned, this man or his parents, that he was born blind?" This must be so hard! But just think that this experience provides an opportunity for God's amazing work to be displayed in the life of your sweet Kate. Praying for you! Praying that Kate kicks the cold virus, that there would be no more setbacks, and that the transplant would go ahead. keeping your sweet kate in my prayers! stay strong momma! sending hugs to you! Hoping things go smoothly from here on out. As a nurse may I suggest that if Kate refuses the hospital crib again when she is admitted for her transplant. Request a regular hospital bed (I would think they have these for older children). You should be in a decent size bed cuddling her all night! Sorry to hear about the setback, but it's obviously what's best for Kate. Hang in there Mama! And like you said, at least you got a "test run" of the hospital & know more of what you need!